It is mandatory for all businesses to have a strong online presence in order to successfully reach today’s consumers. However, most business owners associate being online with attaining customers easily. This assumption could be further from the truth due to the sheer number of alternate businesses that are competing for the attention of online shoppers. Online customers are constantly being persuaded with offers that are only available online, which means that their purchase decisions will be determined by the businesses that provide the best visual presentation along with the best product or service value. 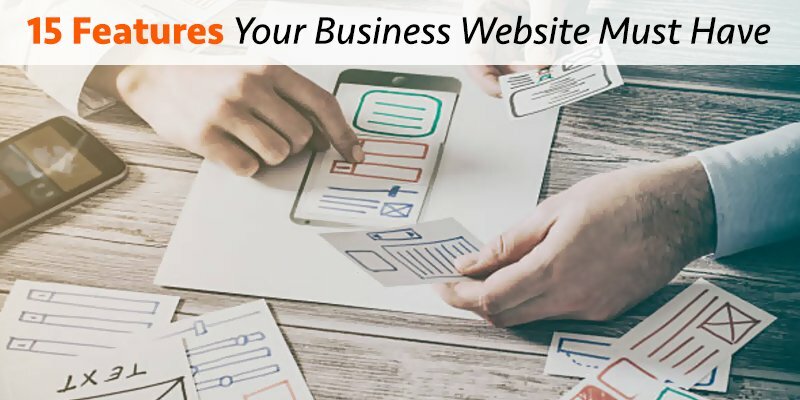 If you want your online business to succeed, there are some absolute requirements to be incorporated into your website to ensure that it is positioned to produce results. The basic requirements for any business’s website include an easy domain name, phone number, and an attractive logo. What should not be forgotten is great content, supporting links, and the ease of navigation for customers on your website. All of these different components add up to give you a great chance at creating leads which can be converted into customers, through your website. When focusing on developing an engaging website, the goal is to make it appealing as soon as customers land on your website. You do not want them to be bored and immediately leave your website. Instead, get them interested immediately so that you can educate them on the reasons for being your customer and nurture them towards becoming one. Remember to present the most relevant information to the visitor first, then follow this up with the necessary facts that customers will want to know about your business. You must also include a strong call-to-action that gives your website’s visitors an incentive to become a customer. This makes the temptation of becoming a customer hard for them to resist — which can only occur if you are focused on effectively communicating why the customer needs your offer. The following are 15 features that your website must have in order for it to succeed in converting visitors to customers. Your domain name communicates to a web searcher what your website is about. If your business offers plumbing services, it should have a domain name such as www.flowingpipes.com and not www.mikeswork.com. The first domain name communicates that your business provides plumbing related services. The second domain name just has your name attached to work. This work can be related to construction, landscaping, or repairing cars. You eliminate the need for the customer to assume and guess by making your domain name specific to your business. Branding is necessary for people to easily identify your business. Thus, a logo that represents your business well is needed. Your logo does not have to be extravagant because most major companies have very simple logos. Nike has the swoosh. McDonald’s has the golden arches. Apple has the bitten apple. All these companies have simple designs that are known because they made sure their logos became a symbol of their business without the company name ever having to be spelled out. Having your phone number present is a call-to-action for viewers on your website to ring up your business to learn more about the products or services you offer. Phone callers are warm leads that want to be educated as to why they should become a customer. Thus, it is important that your phone number is visible and listed at least twice on your webpage — top and bottom of the page. You never know what information a visitor might read that makes them want to get in contact immediately. If your phone number is not visible, this is a potential customer that you have missed out on acquiring. Your tagline states what your business does for the customer. A sample business tagline would be, “We help companies identify solutions that lead to growth and success”. This tagline states exactly what the business is focused on providing to their customers so that visitors to the website will know if they fit the criteria to become a customer. This button needs to tell visitors to take a specific action. You need this action to turn them into a lead, which is why it is called a call-to-action button. Your button needs to have the visitor do one of the following: make a phone call, inquire via email, sign up to be an email subscriber, or download some free content. Regardless of what your call-to-action is, it allows you to gain the contact information about that customer to stay in constant contact with them. Your navigation bar tells people how to get to the specific information they are looking for. Without this being present, they would get frustrated quickly trying to find the exact page that they want and will end up abandoning your website. This is why you need your navigation bar to be at the top of your page so that visitors can easily locate the pages that they need. This feature simply lets people know where they are currently located on your website. It is a good feature to have in case someone gets confused about their current location or wants to bookmark the page that they are on. This section needs to focus on your sales promotions and provide visitors with a call-to-action to make a purchase. Images are more effective than words in this case because they form a positive perception in a person’s mind of what they are receiving with the offer. This is why you must use great images that reflect the quality of the product the customer will be receiving. Using this tactic helps to create more sales. You need to make sure your location, business hours, contact information, and any other basic but important information about your business is listed here. If people cannot find you or contact you, then your business cannot make money. You do not want to miss out on potential customers just because this information is not listed. People need to see the validation of existing customers before they confirm the decision of becoming a customer themselves. You need your current customers to share their previous existing problems and explain how your business provided an effective solution. This information communicates to prospects that your business produces results, and therefore can definitely help them solve their unique problems. Here, you will want to talk about the products and services that your company offers. This does not have to be very detailed information. All you need to cover are the main points so that people understand the value that is being provided through each product or service. This cuts down on people asking what your products or services do, so you can get right into describing how your offer can be effective in helping the customer with their specific situation. Many businesses are using blogs as a way to effectively convert visitors into customers. This is done by educating people about a particular problem that exists in the industry then communicating the solution to the problem. This shows that you have deep knowledge about your industry, which means that you can solve any problem the customer puts forth. Having a blog with quality content elevates your status as a subject matter expert, which means people will start to identify your blog as a quality source of information. This provides you with a fanbase of readers who can easily be converted into customers. Internal links are a great way to keep visitors on your page longer so that they can learn more about your business. The longer that they are on your page, the greater your opportunity to convert them into a customer. This is why you want to have internal links to your best content so that you can grab the attention of visitors immediately and hold on to them by providing them with more interconnected links to explore. This is a tactic that helps to nurture the visitor into a prospect who can easily be converted into a customer with the right offer. Social media is how you stay connected to your customers and prospects when they are not on your website. You can actually engage in conversation with them through your social media platforms, which helps to develop a stronger relationship. You can also blast your promotions and latest news to your social media followers, which is why you want to have a large community of followers. Ensure your social media buttons are listed on your website to have visitors follow your presences on those platforms. You want to capture the contact information of people who visit your website so you can follow-up with them to learn more about the problem they need solving. Your contact form should include a space for their name, email address and/ or phone number, and the message they want to leave. This allows you to follow up with them about their message, with the proposed solution to their question or problem. Including these 15 features on your website will help you capture more leads and generate more sales, ensuring your website serves as an asset to your business. Need help creating a compelling business website? Let us do the work for you. With our experienced web team and attractive web hosting and web design packages, you can count on us to establish your web presence.